1. Drawer : دراز : (noun) a boxlike container in a piece of furniture; made so as to slide in and out. 2. File, File Cabinet, Filing Cabinet : دراز : (noun) office furniture consisting of a container for keeping papers in order. 3. Long : لمبا - دراز : (adjective) primarily temporal sense; being or indicating a relatively great or greater than average duration or passage of time or a duration as specified. 4. 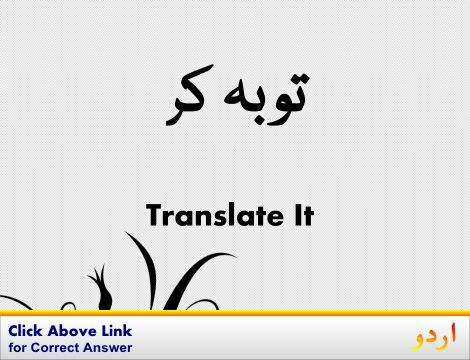 Drawn-Out, Extended, Lengthy, Prolonged, Protracted : لمبا - دراز : relatively long in duration; tediously protracted. Phisalna : Slide : the act of moving smoothly along a surface while remaining in contact with it. "His slide didn't stop until the bottom of the hill"
Asami : Office : a job in an organization. "He occupied a post in the treasury"
Part, Kirdar : Office : the actions and activities assigned to or required or expected of a person or group. "The function of a teacher"
Hirasat : Keeping : the act of retaining something. Hifazat Se Rakh..., Ikhtiyar : Keeping : the responsibility of a guardian or keeper. "He left his car in my keeping"
Tarteeb : Order : the act of putting things in a sequential arrangement. "There were mistakes in the ordering of items on the list"
Ham Aang : Keeping : conformity or harmony. "His behavior was not in keeping with the occasion"
How this page explains Daraz ? We help you understand the word Daraz in English. We not only provide English meaning of دراز but also give extensive definition in English language. You can also find multiple synonyms or similar words along with Daraz. You may also want to see Android app to get دراز, please install Wordinn Urdu Android app now.